There is nothing quite like waking up early in the morning to the sound of chirping birds as they go about their business, making sure that the rest of the world would be awakened via their beautiful singing. It sure as heck beats the honks that hail from the different cars and morning rush hour traffic, right? Well, if you do not have any kind of trees near your home for birds to nest in, perhaps having a faux bird house will do the trick. Of course, since you’re a unique individual who wants something different, the £19.99 CCTV Birdhouse might be right up your alley. Talk about killing two birds with one stone, if you will pardon the pun! The CCTV Birdhouse offers a safe and sheltered haven for your feathered friends, where it has been specially hand-painted and made from a durable but lightweight poly resin. 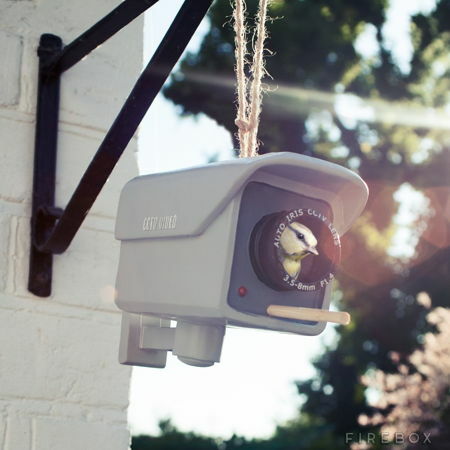 Needless to say, the eagle eyed would-be burglars will be able to see through your ruse, but then again one should never underestimate the ability for the CCTV Birdhouse to function as a theft deterrent of some sort. Something like this has been released in the past, known as the Big Brother Birdhouse, but that design is downright ugly and cantankerous.